OppoStyle.com is offering great prices for several Oppo phones, the the R7, R7 Plus and the N3. They are also offering Accessories discount up to 50%. Black Friday is a perfect day to buy an unlocked phone. Choosing not to get a subsidized phone from your carrier can allow you to get a cheaper plan resulting in savings in the long run. Black Friday deals make it even a better choice. 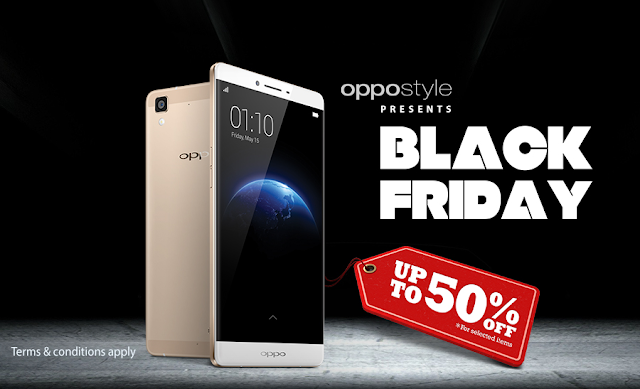 OppoStyle is an International site so it's very exciting that they are also offering Black Friday Deals. The Black Friday promotional offers are available exclusively online. On the North American page, The R7 is discounted to $299 and comes with a free Oppo Selfie Stick. The R7 Plus is discounted to $399 and also comes with a free Oppo Selfie stick! The Oppo N3 is discounted on the European page and is now only €449 (approximately USD 475), That's a great deal for a flagship phone. In addition OppoStyle offers free shipping for orders above US$ 100/ EUR 90. The OppoStyle Black Friday promotion in Europe starts on November 27, 2015, 00:00 GMT until 23:59 GMT and in the USA & Canada starts on November 27, 2015, 0:00 EST, to November 28 02:59:59 EST.